I prepared my first ever bento for JR yesterday to join the Dutch Lady Malaysia lunch box contest. The bento is not in big portion as JR is just 22 months, her appetite is still small. The most important thing is, it must be nutritious hence I followed the food pyramid. I selected Ingredients: Bread, Cheddar cheese, rice, carrots, broccoli, seaweeds, egg, green apple, orange, papaya and a pack of Dutch Lady Kid UHT Choc milk(age 1-6). I used the Winney the Pooh mould that I bought from Tokyo Disneyland to cut the bread. Then I used some plastic mould to cut the cheese into birds shape. Egg was being molded into a heart shape(show my love to JR) and rice was being molded into a bear shape. JR was very happy to see and eat her first ever bento. 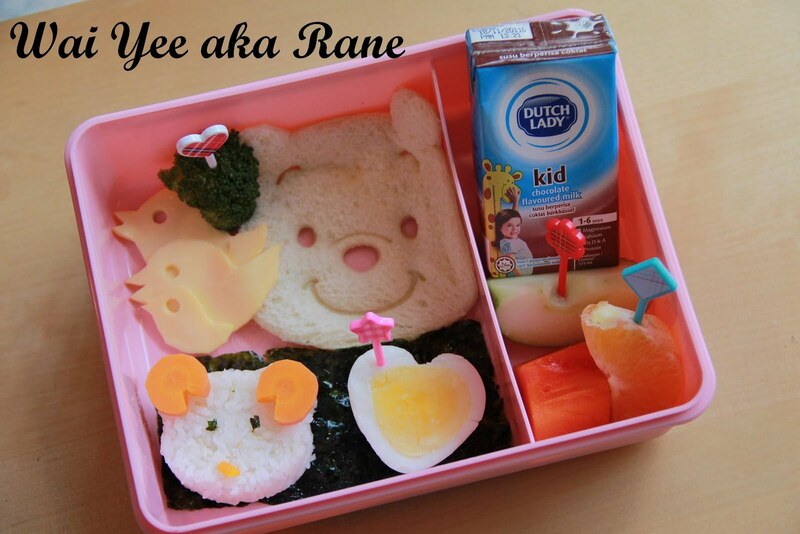 I felt satisfied and promised to make more bento for her in future. I wish you like this. Now, please support me by following the 2 steps below in FB so that I can get into finalist to win some prizes from Dutch Lady.